The pleasure of seeing somebody succeed through my tutilage. Cares that my child will improve his play and enjoy the sport of tennis. My son likes going to the lessons as he is improving and having fun. He enjoys teaching and seeing my son get better, rather than focusing on the financial aspect, which is a good characteristic in my opinion. Definitely recommend. I usually analyze a player's initial playing style and categorize them by skill level. I then ask what playing level they would like to be and which areas they need most help with. I follow that up by asking how much they want to improve and how soon. Finally, I determine if tennis, in whichever aspect of the sport, makes them feel happy. I have played sports all of my life. 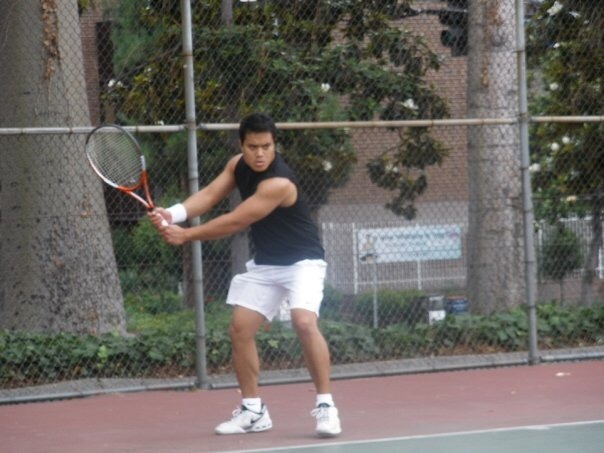 I started out playing basketball, baseball, football and soccer before getting obsessed with tennis 20 years ago. I find myself watching tennis matches all the time. May it be live or on TV, I'm always watching tennis everyday. I also read self-help books on tennis as well as viewing tennis instruction videos online. I have taught tennis in a local community college assisting tennis coaches while in college and eventually taught tennis to others privately through the years.